After more than 230 years in business (and a lengthy line of commissions for many historical figures), Baccarat has risen to become one of the world’s premier names in crystal manufacturing and design. Many a French king has been spellbound by the beauty of this crystal, which began its legendary journey in Lorraine, France, in 1764. Baccarat is triumphantly romantic, harking back to an era of chandeliers, ornate perfume bottles and wine-filled chalices. Of course, Baccarat jewellery continues this sense of wonder, combining couture crystal with assertive colours and a sense of serenity. Together, these aspects make for unforgettable jewels fit for a queen. 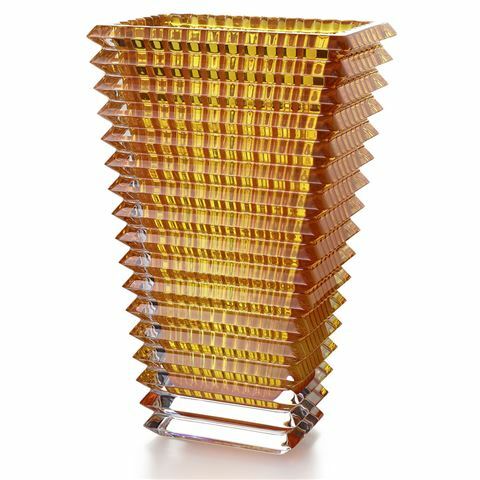 The wavy design of the crystal Eye vase comes from an extraordinary technique: exterior horizontal cuts and interior vertical cuts combine to produce a magic visual effect. Features horizontal cuts on the exterior and interior vertical cuts. Presented in a Baccarat gift box. Dimensions: 18.8cm (l) x 30cm (h) x 13.5cm (w).